Vacation starts in 9 days and while things should be winding down, my dear sweet husband is working harder than ever. For the past 3 months, Cornelius has been in lock-down mode and despite the occasional sleeps and nutrition breaks, it’s been nothing but work-work-work. Friends are always wondering how the husband is since he’s been in hideout mode. Luckily, he works from home and I still get kisses and long, desperate hugs but I can’t wait for these last few days to end. I want to be holding hands in the outdoors and to spend all my waking and unwaking moments with him by my side with nary a computer in sight. When he crawled into bed at 7:30 a.m. the other morning, I knew he’d appreciate a freshly baked treat upon waking. So I went to my old standby scone which is known around here as Molly’s Scone, since the basic recipe came from the always lovely Orangette. I took the recipe, threw in some freshly frozen blackberries and wrestled with the suddenly very sticky dough. The berries added extra moisture and the batter seemed to take on a life of its own, but I continued kneading as best I could and prepared the scones for baking. The results were worth the trouble. I feared leaden nuggets of purple dough but the scones were light and jammy and so delicious! It made for a perfect breakfast with strong coffee and needed hugs. And speaking of Molly, I had the distinct pleasure of meeting her and her newly bethrothed husband, Brandon. Last week while I was fretting over pie dough, I received a phone call from the honeymooning couple who had just arrived in Vancouver and we immediately set up a Saturday morning brunch date at a local restaurant. I’m always a bit nervous meeting new people, but Molly is as friendly and lovely as you might expect (as is Brandon with his cute as a button curls!) and any fears I had about meeting them, melted away immediately. After breakfast, some poking about in shops, and the discovery that we had actual real-life friends in common, we departed ways and will definitely make plans to meet up again. Blogging, it’s an amazing thing! 1. Preheat oven to 425 degrees Fahrenheit. Whisk the milk and the egg together until frothy and then set aside. In a large bowl, blend the flour, baking powder, and salt. Add the butter and blend the mixture with your hands until you have no lumps larger than a pea. Add the sugar and the blackberries and toss about until the blackberries are coated with the flour mixture. Add the egg mixture slowly until the dough comes together. Leave any remaining egg mixture to brush on as glaze. 2. Turn dough out onto a clean counter and knead it no more than 12 times. Pat dough into a round approximately 1/2 an inch thick, and cut into 8 wedges. Place on an ungreased baking sheet or a Silpat. Using a pastry brush, glaze wedges with remaining egg mixture. Bake for 10-15 minutes, or until golden. Cool on a wire rack. I *just* made blackberry scones but haven’t posted on them yet. Yours look fabulous! Mine were so good I wished I had made a double batch. Hey…what a coincidence, we’re leaving in two weeks for our vacation in glorious Greece. It will be my 7th time there and my husband’s first. Pictures to be posted on Flickr upon my return. Wow, those scones look divine and juicy. I have made scones only once before using your recipe for vanilla ginger scones and they were so easy and tasted so much better than the scones I occasionally pick up from the supermarket. I’ve been so lazy lately…not at all in cooking and baking mode. Now that I’m working, I come home and don’t care about being creative in the kitchen. I hope this faze passes. Nice to know that you aren’t too leery about meeting your blog fans & commentors 😉 Perhaps in the not too distant future…? I love blackberries too! and all of your dishes look great! We are really lucky to have the free blackberries in Vancouver… makes up for the high rents!!! I think it is so cool you met up with Molly and her new husband… it is really amazing how people can connect these days. Glad to hear she is as nice as she seems in her blog. Have a great time in Europe! Good to hear that some time off is near. Well deserved. These scones look amazing! I had the pleasure to meet and spend 5 days with Lisa of La Mia Cucina and I totally agree with you that blogging is an amazing thing! 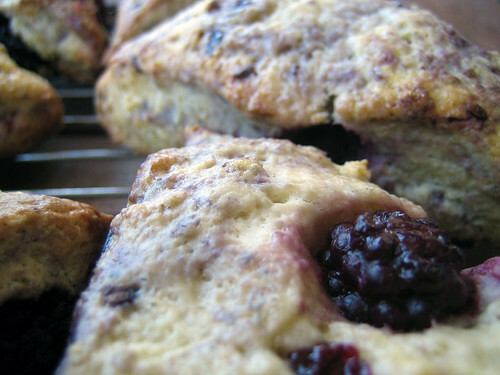 blackberry scones are so good, katerina! i want to see your recipe! homemade scones are the best, joanne. but i can understand not being in baking mode. have a great vacation! hag, free blackberries are the best! and yes, they totally offset all the high rents and housing prices in vancouver! haha. yes, tartelette, i can’t wait for some time off! blogging is wonderful for meeting friends and getting to know people from all over. i love it. Molly, we’ll definitely meet up again (with Cornelius too!) and thank you for sharing your scone recipe. It makes mornings extra wonderful! Cara, yes, I think this would work beautifully with frozen blueberries. Let me know how it works out. ok, i made them and i think i used a bit too many blueberries… but the were still quite yummy! i’ll be making them again but i think next time i’ll sprinkle a small ammount of sugar on top before baking 🙂 overall, tasty scone recipe! cara, i’m sure they were good even with too many berries! definitely try them again…and yes, i forgot to mention that i also sprinkled sugar on top of the scones too!! it was great meeting another food blogger, patricia! mevrouw cupcake, yes, i definitely still want to meet up!! i’ll keep you posted on when we arrive in amsterdam. Yum. My favorite scones are from central market in Houston — they do a bacon-cheese scone that is phenomenal! Have a lovely time in Europe! We just got back from our first trip there–I had many back-entries of blogs to read when I returned. We spent our two weeks in Italy, but I’d love to see nothern Europe sometime, as well. wendy, a bacon-cheese scone sounds awesome! 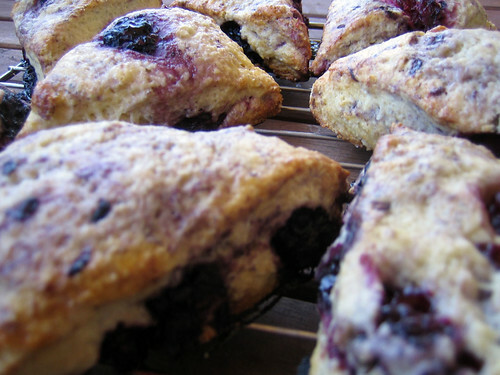 eat me delicious, these scones are great with whole wheat flour, in whole or part. it’s an easy recipe to adapt. jen, welcome back! i’m so excited since this will be my first time to europe as well! Hi! I have just discovered your blog and have to say that you have a new reader! Your recipes are very interesting and absolutely seducing, mouse-watering photos. I made these tonight and ate one fresh out of the oven. oh…my…god! sooo good! thanks for sharing the recipe! i can’t wait to have one for breakfast tomorrow. I’m trying the scone recipe. I’ll let you know how it turns out.